Yes, it's time for the New Jersey Association of Corvair Enthusiasts' annual Corvair Parts Auction, indoors at Ashley's Auto Body. Free admission, lots of laughs, and FREE LUNCH! Complete details can be found on the club's web site, here. 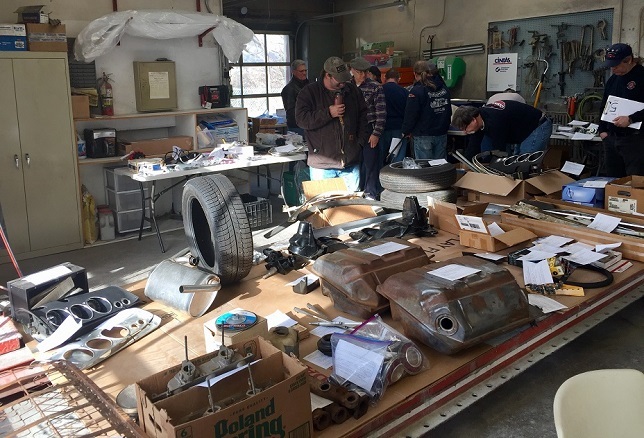 Our annual Parts Auction, an NJACE club staple now dating back more than 30 years and one of our most popular events of the year, is all set for Saturday, February 16 2019, indoors at Ashley's Auto Body on Hillside Avenue in Flanders. 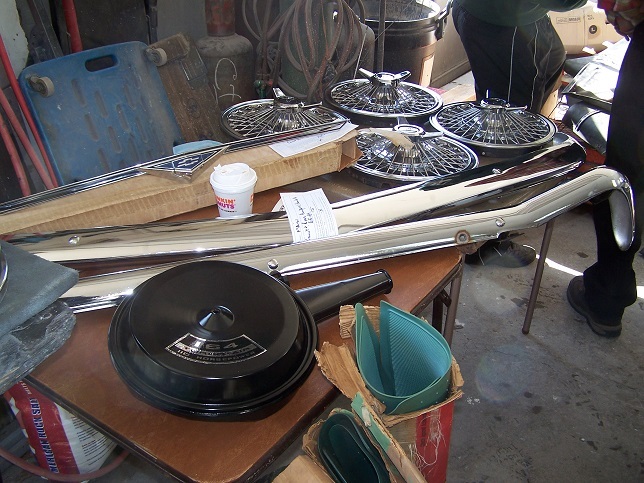 At the auction our shameless auctioneers offer Corvair parts and Corvair-related items to the highest bidder, with a 10% commission of the sale price going to the club treasury. You may bring parts to sell, you may buy, or you may do both, or you may just come to enjoy the fun. First, plan on making a day of it. Due to the nature of how the auction operates, it is not possible to process any buyers or sellers until the auction is completed. Doors open at 9:00 AM for set-up, we begin the bidding at 10:30 AM, take a pizza break at 12:30, resume the bidding at 1:00 PM, and finish up typically around 2:30 PM. Only at that time can we tally the sales, collect from the buyers, and pay the sellers. Second, plan on getting there early. 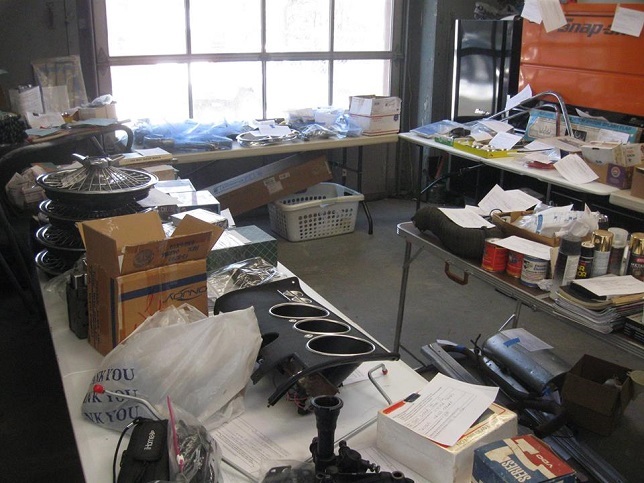 As we said we'll open the doors at 9:00 AM, to allow time to tag and display any parts you are selling, and to allow you to peruse the parts being offered. 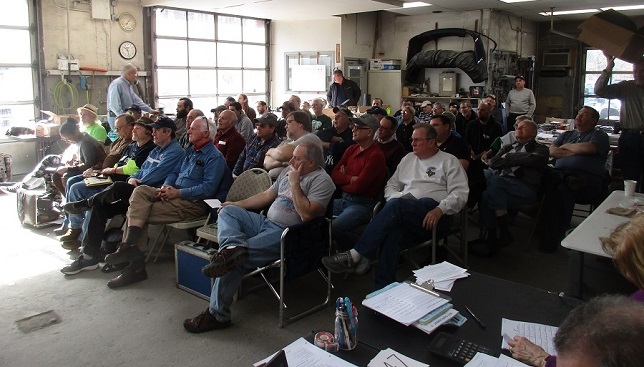 If you're selling, you will need to fill out an Auction Lot Card for each part or group of parts being sold as one, so please allow sufficient time to do this before the start of bidding. But you can also get blank lot cards that day. 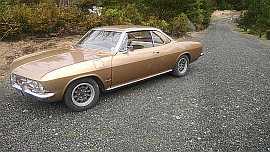 We ask that items being offered be limited to Corvair parts or Corvair-related items, only. Also, we ask that you not bring more than one of the same item to sell. You can, however, sell multiple items in a "lot." You could offer, say, one lot of six oil filters, instead of six individual oil filters. Remember that only quality items sell easily. Greasy, rusty, bent and broken pieces have limited appeal. The club will deduct a 10% commission on all sales. You may also donate items for the full benefit of the club. Did we mention that lunch is included at no charge? Now, what about that "Snow Date?" We will invoke a snow date only if the weather makes traveling difficult or if accumulated snow has rendered the Ashley's parking lot inaccessible. Generally speaking, you can assume that the event is "on," but if it is necessary to postpone we will get the word out via email. Edited 4 time(s). Last edit at 02/18/2019 06:30PM by MattNall. I will be there as usual bringing both new and used parts to sell. 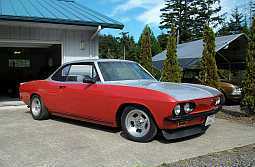 I've always thought this would be a great event to add to the Corvair shows. 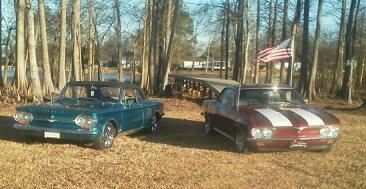 All good corvair events seem to take place when I can not attend. I work saturdays. Actually there is such a thing as free lunch. Besides all the great parts available, entertaining auctioneers, the pizza is free. My wife looks forward to this event each year--bought an LP of oldies with a Corvair on the cover and an old club jacket. If you're within driving distance you'll regret not attending. Thursday evening update: The weather forecast is not perfect, but it's favorable, so the auction is on! one day left really looking forward to get some really amazing stuff. Another packed house yesterday in New Jersey and a lot of good bargains were had. A thanks again to NJACE for hosting this event. A HIGHLY successful auction! Great weather, which helped bring out a large crowd, the largest we've ever had. More than 50 registered bidders, a new record. Plenty of fever-pitch bidding, and a very high sell-through rate. Attendees from six states, from Massachusetts to Virginia. Thank you to everyone who attended, and THANK YOU to Larry Ashley for opening his shop to us again this year.